A cultivar of Camellia japonica L. ‘Camellia splendens vera. – We possess two varieties of C. Splendens: the first has a single flower, and is not remarkable; the second, whose leaves very much resemble those of C. Magniflora plena has a superb appearance; its flowers very large, full, regular, deep cherry-red, No.5; petals, rounded, imbricated, some of those in the centre contorted, and formed into two separate hearts. – Superb.’ [Berlèse Monography p.81/1838]. Berlèse gives the origin of Camellia splendens vera as Europe and its country of introduction as England. Listed in the 1845, 1850 and 1857 catalogues [T.263/1845]. Probably obtained from Loddiges’ Nursery, either in a case of plants brought back by Bidwill or in a direct importation in late 1844. Concerning the latter Macarthur wrote on 6th January 1845 that he now had five camellias ‘which we had not before’, and of the former that he had saved 60% of the plants: ‘You will judge therefore how much I am in your debt’. [MP A2933-2, p.28]. The identity of this camellia is uncertain. Splendens means ‘shining, gleaming, brilliant [Stearn] and is usually associated with red flowers. It may be Berlèse’s Camellia splendens vera but ‘Splendens’ is also a common synonym for Camellia japonica ‘Coccinea', which see. Many other camellias were also given the name ‘Splendens’ in some form, e.g. ‘Splendens Alba’, bred by Cels in France in 1836, probably from the original cultivar of that name. [ICR]. 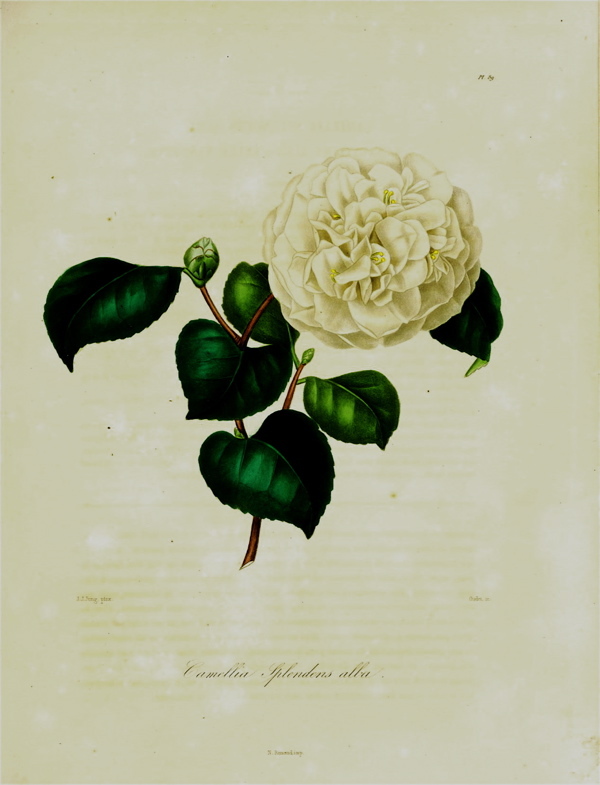 Illustrated is Camellia japonica ‘Splendens Alba.’ [Berlèse Iconographie vol.I pl.89/1841].